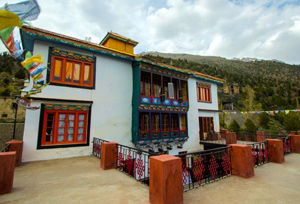 Amidst the hilly terrains of the Himalaya rests a small and quaint Buddhist shrine called Shashur Monastery. The literal meaning of "Shahsur" is blue pines; it is completely compliments with the name of the monastery because it is surrounded by the blue pine trees which share shoulders with each other. 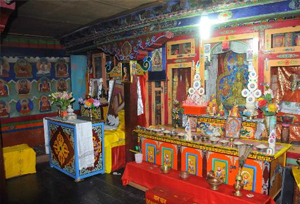 Shahshur monastery is related to the Gelukpa order or red hat sect of Tibetan Buddhism. The monastery was founded by the Lama Dewa Tyatsho hailing from Ladakh in the 16th century but its construction was stopped after awhile. Later, the construction of the monastery was restarted by Lama Dewa Gyatsho in the 17th century. 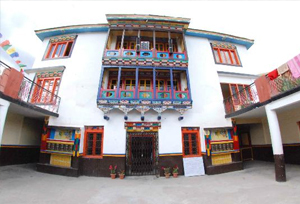 It is also believed that Dewa Gyatsho stayed in the monastery till his death. 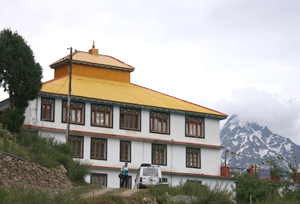 Shashur monastery is perched at an elevation of 600 m above the valley, and one need to pass through hilly terrains and narrow valley to reach the monastery. Built in accordance with the Mandala concept whose basic form is a square having four gates containing a circle with a center, Shahshur monastery is praised all over India for its excellent architecture. The walls of the monastery are decorated with beautiful paintings showing the 84 Siddhas of Buddhism, 5 meter Thangka (beautiful silk painting with embroidery done all over it) and a statue of Namgyal. The monastery is at its best during the month of June and July as an annual festival is organized here. During the annual festival, colorfully dressed and masked monks perform the devil dance widely known as chaam dance. Shahshur monastery is a prominent Tibetan Buddhism learning center as well, which attracts tourist from not only India but across the world.